Forecast and technical analysis EURUSD on November 06, 2018. On Monday the 5th of November, trading on the euro closed up. After falling to 1.1354, the price recovered to 1.1424. At the beginning of the European session, the pressure on the euro left investors feeling anxious over the fact that the conflict between the Italian government and the European Commission was not resolved. In the US session, the euro received support from the strengthening of the pound against the dollar. The pound rose on reports that the UK is close to concluding an agreement with the EU. 10:00 Germany: factory orders (Sep). 11:15 Spain: Markit services PMI (Oct). 11:50 France: Markit services PMI (Oct). 11:55 Germany: Markit services PMI (Oct). 12:00 Eurozone: Markit PMI (Oct). 16:30 Canada: building permits (Sep). 18:00 US: JOLTS job openings (Sep). The price has reached the level that I expected to see, but the way it formed was different. Market participants are awaiting the outcome of the US mid-term elections. The Democrats are predicted to get a majority in the House, and the Senate will remain under Republican control. In this case, the euro will strengthen, as it will be difficult for Trump to implement his economic plans. The price is trading near the balance line. 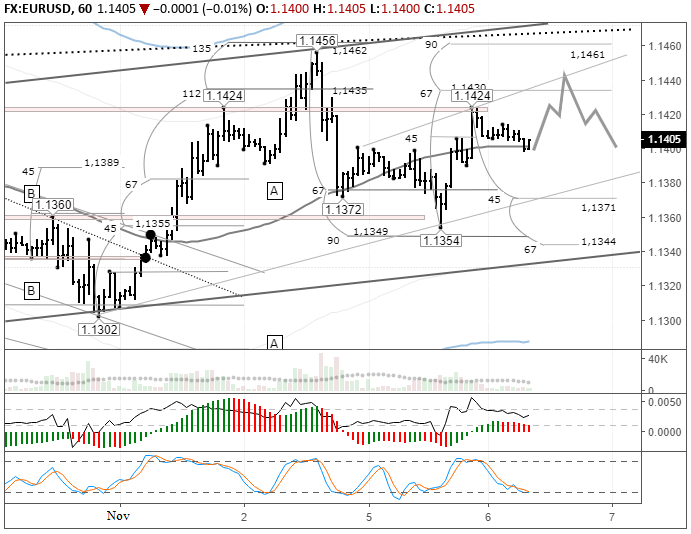 Considering that the stochastics are in the euro buying zone, according to the forecast, I expect the price to recover to 1.1442. On Wednesday, the regular meeting of the US Federal Reserve Open Market Committee will be held. The regulator will leave the base rate unchanged. An increase is expected in December, therefore, some key events to keep an eye on are the US mid-term congressional elections and the situation in Europe with regard to Italy's draft budget for 2019. It's worth keeping one eye on the spread between the yields of Italian and German 10-year bonds, and the other on 10-year US bonds.